If you have seen a DNR truck slowly riding down a rural road about an hour after sundown this summer, it may be part of a cooperative research project that is surveying bat populations across the state. The Carolinas Acoustic Bat Project, a cooperative research project taking place in both South Carolina and North Carolina, is funded by the U.S. Fish and Wildlife Service. Researchers drive carefully specified routes two consecutive nights with a recording device mounted on the cab of their trucks. The 20-mile routes must be driven at 20 mph in order to capture the data accurately. The recordings are then analyzed to determine which species of bats were heard and how abundant they were. 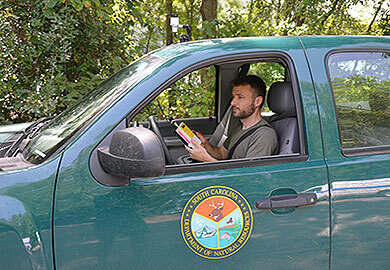 "It’s very exciting to start this acoustic sampling," said Mary Bunch, wildlife biologist and bat expert with the S.C. Department of Natural Resources (DNR). "The goal is to establish these routes and perhaps add more routes in areas that haven't been surveyed. It is wonderful that so many people have pulled together to make this happen. After we have the kinks worked out, this can provide a volunteer opportunity for citizen scientists." Bats are an essential, beneficial part of ecosystems, according to Bunch. Bats are the primary predators of night-flying insects including many crop and forest pests, consuming over half their body weight in insects each night. Bats currently face a serious threat in White-Nose Syndrome, a disease that has caused catastrophic declines in hibernating bats. Partners in the Carolinas Acoustic Bat Project include DNR, U.S. Fish and Wildlife Service, Clemson University, the U.S. Forest Service Southern Experimental Station and the National Wildlife Refuge System. "Bats are notoriously difficult to study," said Clemson University graduate student Ben Neece, "because they are active at night, can detect nets and traps, and, of course, they can fly and often are fairly secretive when roosting. Most of their vocalizations cannot be heard without the aid of electronic equipment, so the acoustic survey routes will allow us to effectively monitor these elusive animals." Ashley Watford, an intern from Francis Marion University who has assisted with the bat surveys in the Pee Dee region, said: "I was struck by how most of the bats we heard were near residences with security lights, presumably because they were targeting insects, including mosquitoes, that were attracted to the lights." Motorists are advised to please be patient if you end up driving behind one of these surveys. If researchers stop to let you pass, or deviate from 20 mph, it disrupts the data collection, potentially ruining the entire night’s work. For more information on the Carolinas Acoustic Bat Project contact Ben Neece at bneece@g.clemson.edu.